I am Muslim. Would You Hug Me? In light of recent terrorist attacks associated with extremist Muslims, a Salem student has attempted to bring attention to a more humanistic view of the Islamic community. 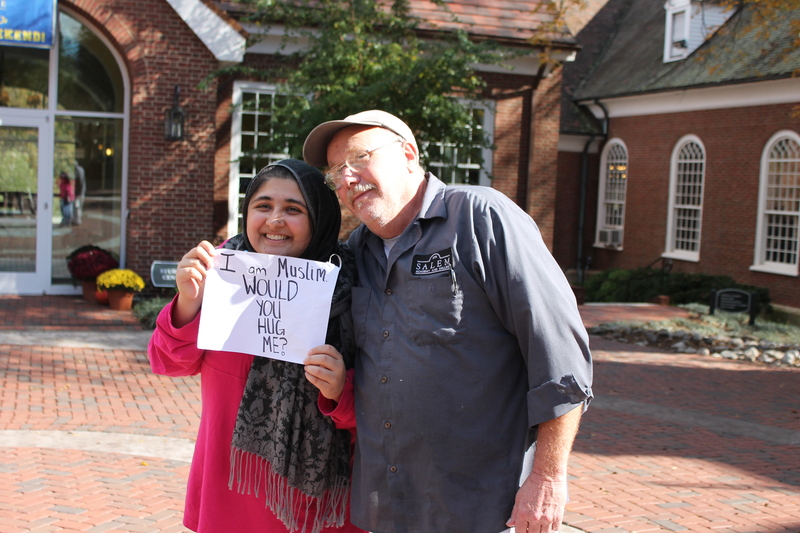 On a November afternoon, Misbah Khan, C’17 decided to participate in a national movement whose initiative is to shine light on issues Muslims are facing today via a campus social experiment. Fortunately, Salem’s community showed immense support towards Khan, but recent incidents tell a different story nationwide. In Sept. 2015, a student in Texas was arrested for his homemade clock that was perceived instead as a bomb. He was openly of the Muslim faith. The public’s perception of Muslims also affects the ongoing refugee crisis. Several political leaders such as Texas Senator Ted Cruz and former Florida governor Jeb Bush have asserted that America should increase regulations for refugees in the name of national security. Cruz has also called for a religious test for those seeking refuge. “There is no meaningful risk of Christians committing acts of terror. If there were a group of radical Christians pledging to murder anyone who had a different religious view than they, we would have a different national security situation,” Cruz said at an event in Myrtle Beach, S.C. on Nov. 15, according to The Washington Post. In response, President Barack Obama encouraged people to consider if the idea proposed by Cruz fits with American ideals. Khan’s social experiment was an effort to humanize the often generalized and marginalized Muslim community.